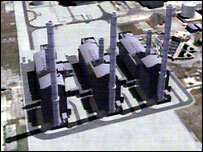 Hundreds of new jobs could be created on the Isle of Grain in Kent with plans to build a new gas-fired power station. The £350m state-of-the-art plant will have the capacity to supply electricity to a million homes. E.ON, the company which runs Powergen, had considered converting an existing oil-fired station at the site, which will be retained in case it is needed. It has applied to the Department of Trade and Industry for consent to build the 1,200 megawatt station. E.ON has also been consulting with Medway Council and local stakeholders. Spokesman Jonathan Smith said the construction of the new plant could mean hundreds of jobs for the local area, while about 50 would be created once the station was up and running. He said the new gas-fired plant would "be a case of fewer emissions coming from modern technology" and would be much more energy efficient and greener than the oil-fired plant.